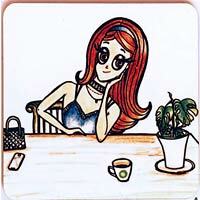 Sleek, chic and glossy – these tea coasters will take your coffee break to the next level. 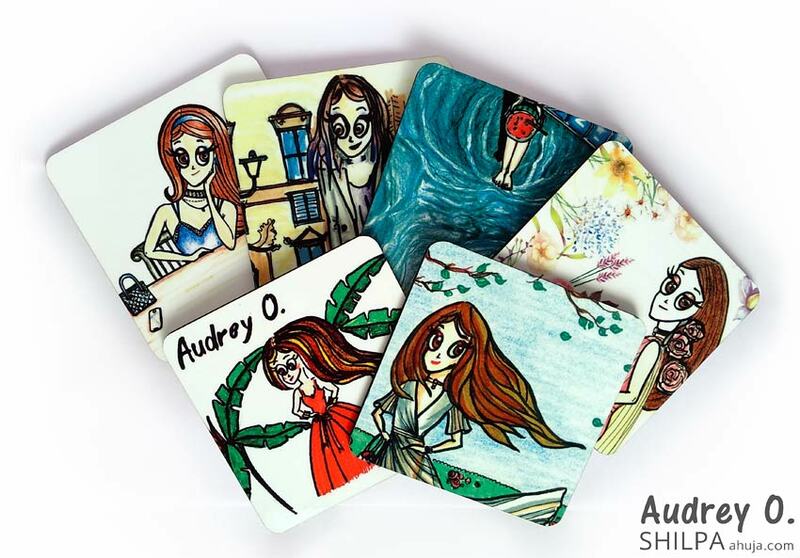 We have 6 designs – featuring your favorite cartoon, Audrey O. Take your pick of travel, fall, girl-in-a-cafe or summer themed! 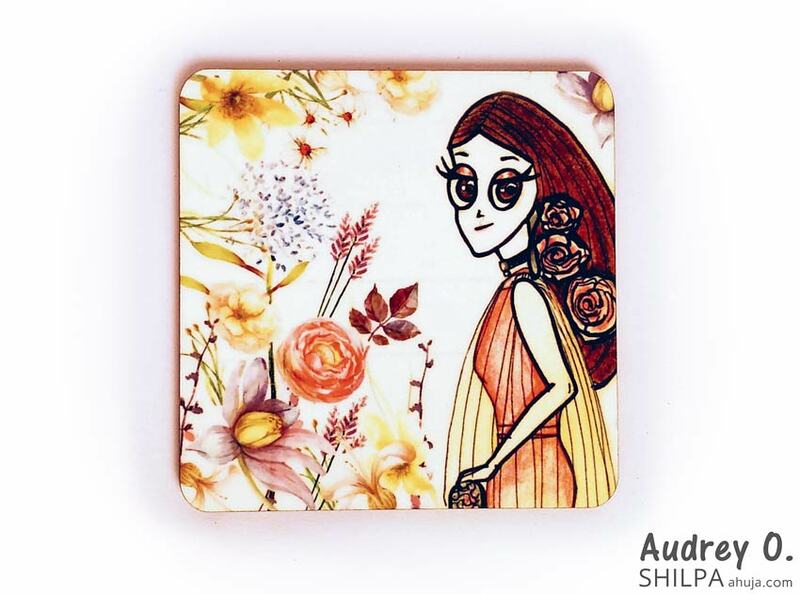 Each coaster features vibrant, high-res sketches by Shilpa Ahuja. Shipping INR 50. Coasters reach in 4-6 days. Available in India. 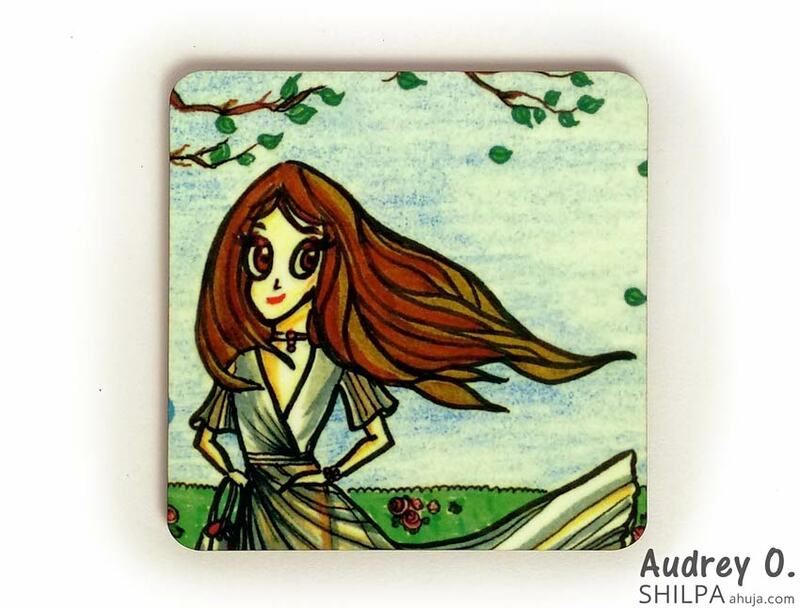 Coaster set of 4 is ₹499. 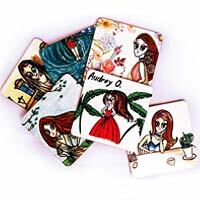 Coaster set of 6 (assorted) is ₹1049. Choose from six striking designs. Go either for a single coaster or a set containing 4 coasters. Or go for a set of 6 assorted ones. A mix of designs is perfect to adorn your dining table with and provide a base for your glasses or cups! Place them around your house and take a couple to place at your office desk! These beautiful designer coasters are the perfect way to enliven any surface, while protecting it from spills or messy drips. 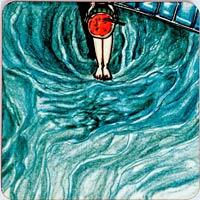 A lot of these tea coaster designs are inspired by my personal experiences or moments of my life. Hope they help you create your own special moments! Art is the perfect way to shut off the world for a few minutes, helping you clear your thoughts. 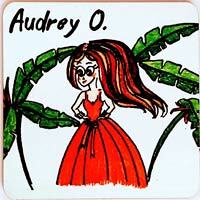 Each coaster is sure to transport you into the Audrey O. dreamland, so that your tea-time becomes happy and reflective! 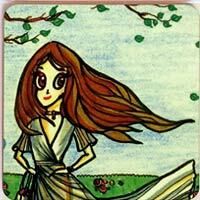 Visual art helps you find your imagination, makes you think and increases creativity. Coasters come in set of 4, unless specified in details below. Made of MDF (wood-like material) with rounded corners. Wanna have your morning cuppa while dreaming about your next travel destination? We know that Rome serves some great cappuccino! 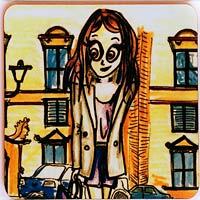 Inspired by my own trip to Rome, the background in this sketch replicates one of my own pictures from my trip. 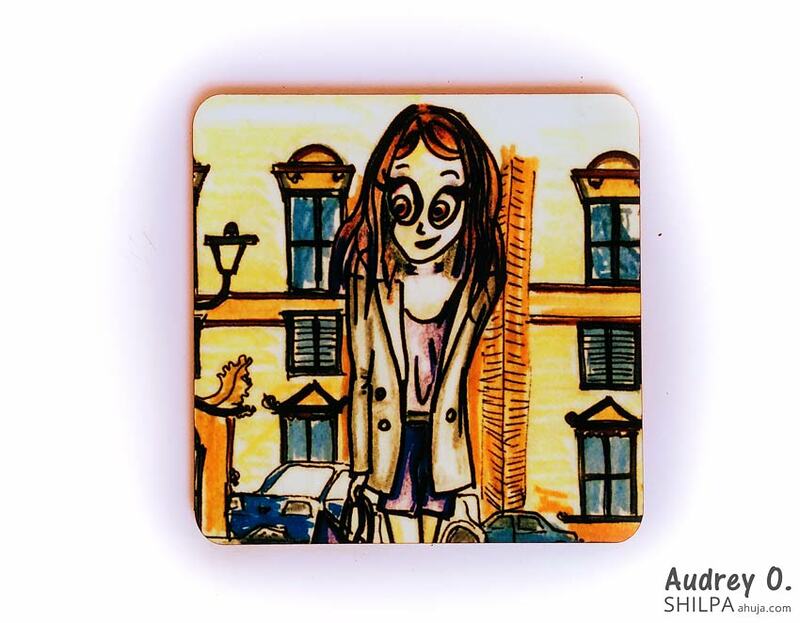 Let this coaster featuring Audrey O. traveling in Italy inspire you, too! Dressed in a red ball gown amid banana trees, wind blowing her hair – Audrey O. seems to be enjoying a vacation right in Chennai, the home of ShilpaAhuja.com! 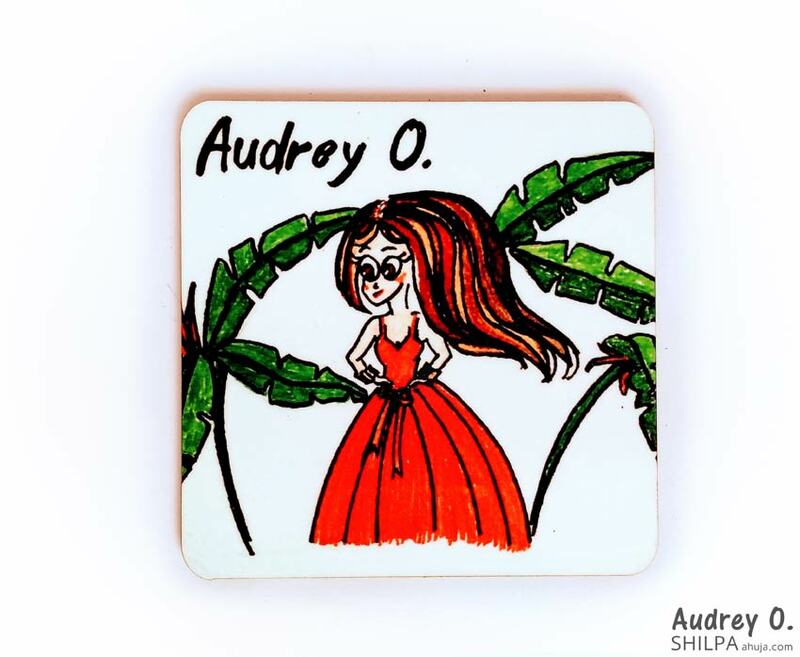 Inspired by my home’s terrace, this beautiful, vibrant coaster is sure to give you some tropical vibes. Let it take you someplace else during your coffee break! A coffee break is the perfect me-time that brings about creative ideas and fresh thoughts. And that’s exactly what this design depicts! “I’ve been thinking,” is is the beginning of a sentence. So fill in the rest with your own thoughts and plans for the day while you place your coffee mug on this gorgeous coaster! Summer time is fun time! And Audrey O. doesn’t wanna miss a chance to drink watermelon juice from the biggest watermelon as she dips her feet into a vibrant pool! 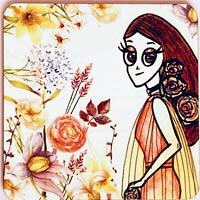 This feel-good funky coaster set will certainly revive any mood! Dressed in a couture gown, Audrey O. is living the dream in this design! Enjoying the cool weather, as the wind blows her hair along with the leaves, Audrey O. is revelling in the early-fall transition season! Nature creates all of the most beautiful things! Here, Audrey O. enjoys an evening in a garden as she matches her dress with the flowers, and adorns her hair with big roses! 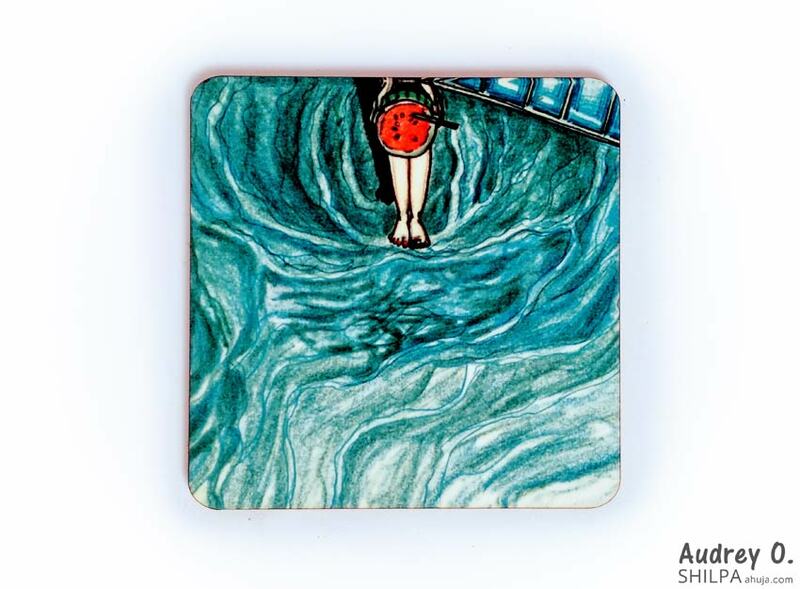 Can’t decide which coaster design to buy? 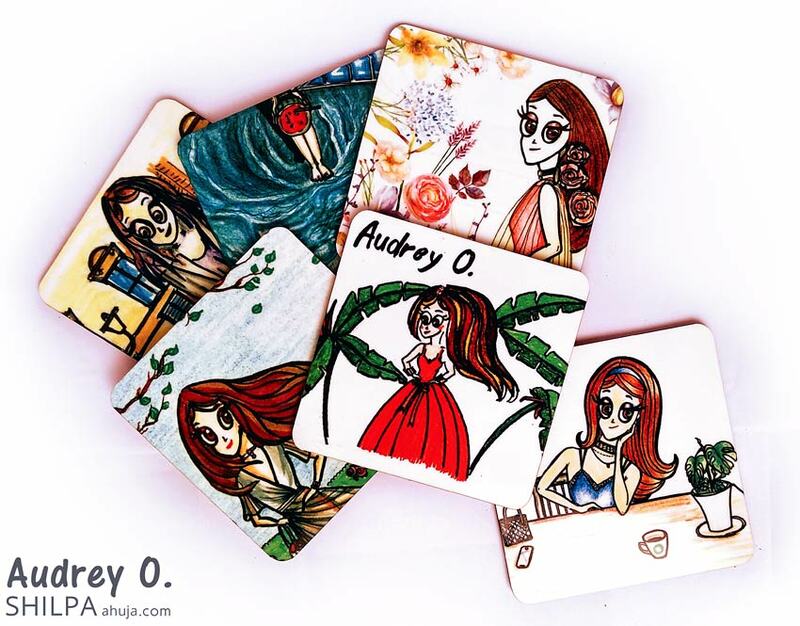 Well, here’s the perfect assorted set of 6 tea-coasters just for you! Enjoy the best of each cool design and get an overload of cuteness on your dining table or office desk!